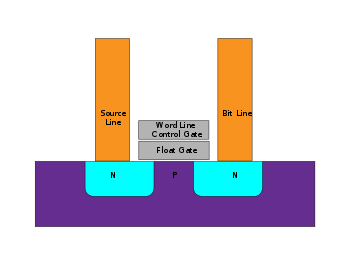 Vertical NAND (V-NAND) memory stacks memory cells vertically and uses a charge trap flash architecture. The vertical layers allow larger areal bit densities without requiring smaller individual cells. 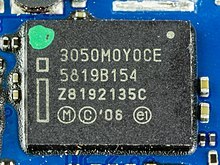 V-NAND, also known as 3D NAND or BiCS Flash®, was first manufactured by Samsung in 2013-2014. ^ a b Kawamatus, Tatsuya. "Technology For Managing NAND Flash" (PDF). Hagiwara sys-com co., LTD. Archived from the original (PDF) on 15 May 2018. Retrieved 15 May 2018. ^ Cooke, Jim (August 2007). 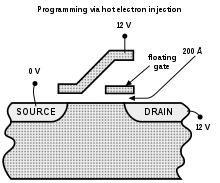 "The Inconvenient Truths of NAND Flash Memory" (PDF). Flash Memory Summit 2007. Archived (PDF) from the original on 15 February 2018. ^ Kim, Jesung; Kim, John Min; Noh, Sam H.; Min, Sang Lyul; Cho, Yookun (May 2002). "A Space-Efficient Flash Translation Layer for CompactFlash Systems" (PDF). Proceedings of the IEEE. 48 (2). pp. 366–375. Retrieved 15 August 2008. ^ "PBlaze4_Memblaze". memblaze.com. Retrieved 28 March 2019. ^ Ramseyer, Chris (9 June 2017). "Flash Industry Trends Could Lead Users Back to Spinning Disks". AnandTech. Retrieved 11 June 2017. ^ "PBlaze5 700". memblaze.com. Retrieved 28 March 2019. ^ "PBlaze5 900". memblaze.com. Retrieved 28 March 2019. ^ "PBlaze5 910/916 series NVMe SSD". memblaze.com. Retrieved 26 March 2019. ^ "PBlaze5 510/516 series NVMe™ SSD". memblaze.com. Retrieved 26 March 2019. ^ Vadim Tkachenko (12 September 2012). "Intel SSD 910 vs HDD RAID in tpcc-mysql benchmark". MySQL Performance Blog. This page was last edited on 21 April 2019, at 00:05 (UTC).